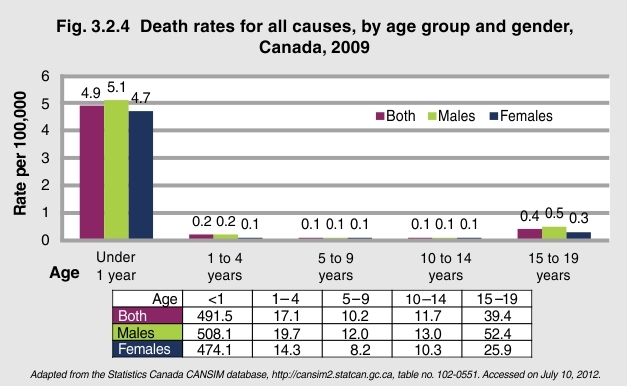 Adapted from the Statistics Canada CANSIM database, http://cansim2.statcan.gc.ca, table no. 102-0551. Accessed on July 10, 2012. While Canadian children and youth enjoy relatively good health compared to children in other parts of the world, they still face challenges to their health and well-being. These challenges vary according to age group and gender. In 2009, as in previous years, infants had the highest death rate among children and youth. Male infants had a higher death rate (508.1/100,000) than female infants (491.5/100,000). Between the ages of 1 and 14 years, death rates were consistently low and did not vary significantly between age groups. For youth 15 to 19 years of age, death rates were slightly higher, which is in part attributable to the increase in deaths due to injury among youth in this age group.